75 Main Restaurant and Lounge owned by restaurateur Zach Erdem is "the place" to be seen and to dine in Southampton, Long Island, New York. Celebrities and locals alike flock to 75 Main Restaurant and Lounge for the stylish ambience, attentive service, and inspired menu created by Executive Chef Mark Militello. 75 Main Restaurant and Lounge opened in June 2010 and the first time that Edward and I dined there was on a very snowy and cold night in January 2011 when the ambience was warm and inviting. The second time that we dined there was in mid-September 2013 and the restaurant was just as inviting with its walls of windows overlooking the boutiques on Main Street open so that patrons could sit outside and enjoy the last days of summer. Indoors, the restaurant was bustling with energy, patrons lining the large bar in the center of the room where they gathered to enjoy cocktails, conversations, and sports on the large flat screen television, and diners celebrated life's special moments at the tables. The attractive restaurant is cool Hamptons' chic with white wainscoting and white walls accented by large artwork by Chris Brown and Rafael Mazzucco. Dark wood chairs with red and black leather cushions flanked tables dressed with white linens and votive candles, and palm trees added interest. Since we last dined at 75 Main Restaurant and Lounge we learned that there is a new talent in the kitchen, award-winning renowned Executive Chef Mark Militello, whose menu is a blend of inspired recipes as well as traditional favorites to appeal to diverse palates. 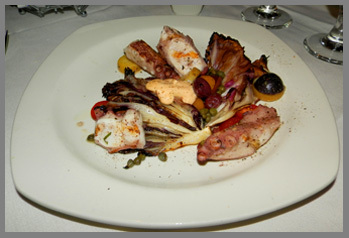 To begin, Edward had the Grilled Octopus, which was gorgeous and consisted of a generous portion of grilled octopus, grilled radicchio, tomatoes, fingerling potatoes, kalamata olives, and capers to enhance the dish with a bit of brininess and salt. The restaurant has a nice selection of wines by the glass as well as by the bottle, and Edward paired the Grilled Octopus with Chianti ‘Gabriela' Tuscany, Italy which was dry on the palate with bold flavors and an aromatic nose. For me, there was the Lobster Salad, an attractive dish highlighting colors, textures, and flavors, made with shaved endive, basil, cherry tomatoes, sliced avocado, lemon, and olive oil interspersed with a generous amount of succulently sweet lobster, which I paired with Gavi ‘Marchesi di Barolo' Gavi, Italy, for its fruity and flowery notes, with hints of green apple and citrus on the palate to pair with the seafood. 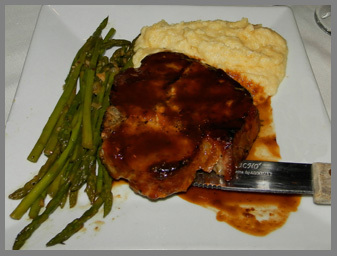 For his main course, Edward had the Heritage Grilled Pork Porterhouse covered with a rich sauce and accompanied by very tender, pencil-thin, green asparagus, and creamy polenta. 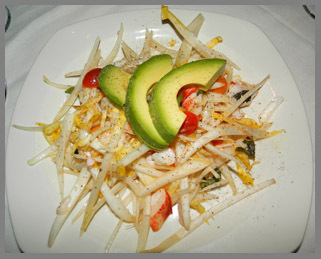 This was a generously portioned main course that was well executed, with a nice blend of complementary flavors. 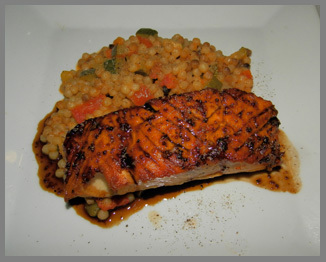 For my main course, I had the Pan Roasted Salmon, which was a generous portion of salmon with a honey balsamic mustard glaze and large pearl couscous studded with tomatoes, small diced zucchini, in a tomato broth to capture Mediterranean flavors. 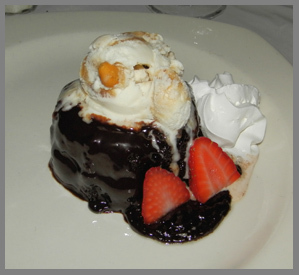 We finished our dining experience by sharing the 75 Main Lava Cake which was warm chocolate cake dripping with a chocolate fudge sauce, paired whipped cream, crowned with salted caramel ice cream, and garnished with fresh strawberries that was more than decadent enough for two to enjoy. 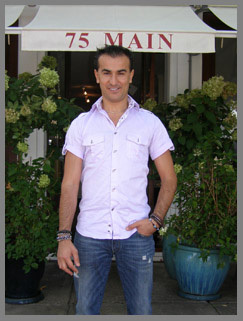 Speaking with owner Zach Erdem we learned that in addition to 75 Main Restaurant and Lounge in Southampton, New York, he has opened a second restaurant, 75 Main Delray, located at 270 East Atlantic Avenue, in Delray Beach, Florida. Telephone: +1-561-243-7975 or +1-561-266-3687. If you are heading south, you might like to visit Zach's newest restaurant. 75 Main Restaurant and Lounge is open year-round, Monday through Friday for Breakfast, Brunch Lunch from 11:00 am until 4:30 pm, and Saturday and Sunday from 10:00 am until 4:30 pm. The restaurant is open for Dinner Sunday through Thursday from 4:30 pm until 10:30 pm, and Friday and Sunday from 4:30 pm until 11:00 pm. The Lounge is open Friday and Saturday from 10:30 pm until 4:00 am. 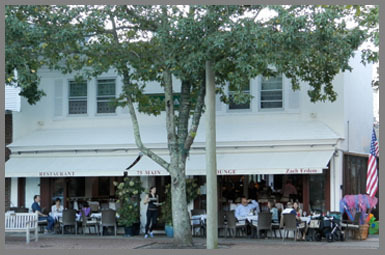 Visit the website www.75Main.com for more information on the Southampton and Delray Beach restaurants. 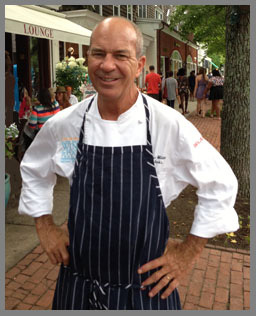 Read the Chefs' Recipes section for an interview with Chef Mark Militello who graciously shares a taste of the restaurant with his inspired recipe for fish grilled in fennel. Read other articles on The Hamptons in the Destinations, Hotels and Resorts, and Restaurants sections. For information on Southampton Village, please visit the website:www.SouthamptonVillage.org. © October 2013. Luxury Experience. www.LuxuryExperience.com All rights reserved.